Just some of my favorite egg photos I took on Easter. I loved Michelle's idea of dying letters onto the Easter eggs, so I did the first initial of each of my nieces and nephews, plus Baby O's for our hunt. I used painters tape (we've been remodeling) and cut out each letter (my cousin's way is much faster.) 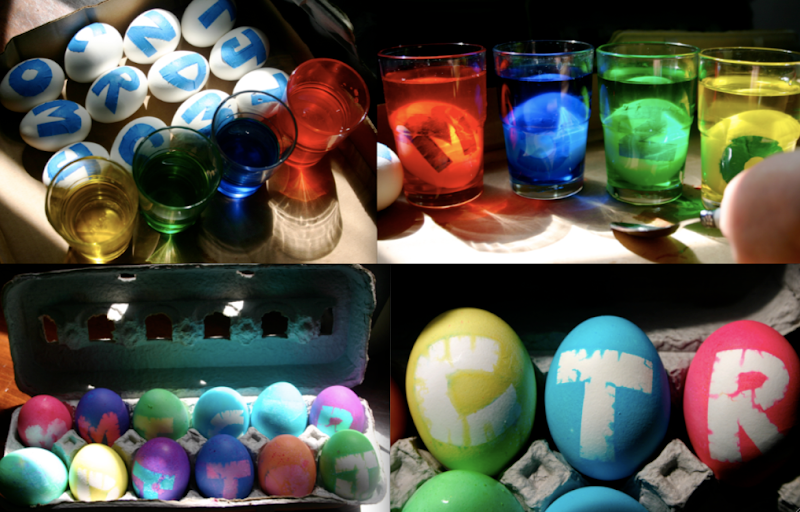 The tape wasn't super strong, so it left a cracked/tie dyed look on the eggs...I sort of liked it. Most of the kids found their eggs, but Baby O seemed to have a lot of eggs with "O's" on them. Turns out that when other people dyed their eggs and left them to dry, they created a circular pool of the color...making an "O". these are all so creative! and what great pictures!! These are awesome! I love finding new ideas for dyeing eggs. I love the egg photos. You are quite the Martha Stewart! These turned out great! I really like the painters tape idea.